Tests included in the protocol have been selected on the basis of their relevance/priority (“Keep it simple”). The protocol should be applicable to any type of digital mammography system (DR and CR). The protocol should be “compatible” or at least “not in contradiction” with other existing protocols. The protocol should not require the use of a specific test object, and consequently, should be “tolerant” about image quality parameters and criteria. The protocol should be widely applicable and adaptable to local regulations. The protocol should provide clear instructions about each test procedure, in order to minimize the potential for misinterpretation. Your feedback is greatly appreciated. Once you have used the protocol, please send comments or suggestions to: Alberto Torresin at alberto.torresin@unimi.it. 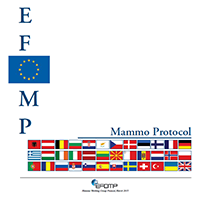 You are kindly asked to complete the on line survey on the EFOMP Mammo Working Group protocol at: https://goo.gl/XuZEBJ. Quality control of cone-beam computed tomography (CBCT) systems is an essential part of quality assurance to periodically check that quality requirements are met, reduce uncertainties and errors and reduce the likelihood of accidents and incidents. Radiation exposure levels must be measured to ensure that patient doses associated with CBCT examinations are kept as low as reasonably achievable consistent with the required diagnostic information. 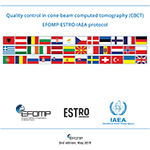 The main purpose of this document is to present procedures for quality control of CBCT systems used for dental, radiotherapy, interventional radiology and guided surgery applications.